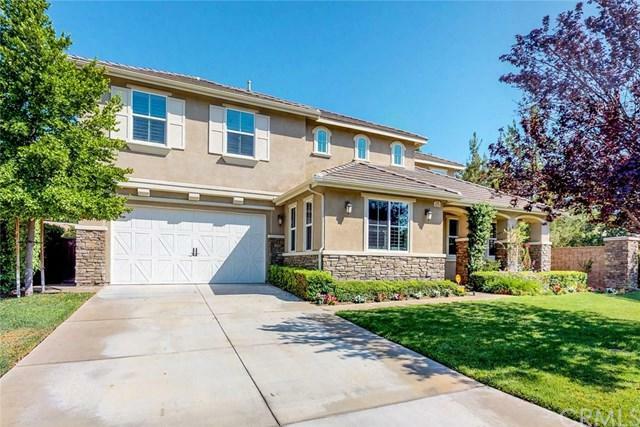 STUNNING Large Family home on a corner lot in one of the best neighborhoods in South Temecula - Wolf Creek!! Sitting on a 13,000+ SF lot, this home has been meticulously cared for by one owner. 5 bedrooms, 3 full baths, downstairs bed and bath, HUGE family room/Kitchen combo, bonus/game room off the family room, HUGE loft upstairs + Media Center, Spacious Master Suite with his and hers closets and double vanity sinks, 3 more spacious bedrooms upstairs with their own stylish bathroom. Upgrades include custom Porcelain tile flooring, Plantation Shutters, Custom window coverings, Upgraded cabinets throughout, Ceasar-stone counters, Custom molding throughout, Custom Built-ins throughout. Outside you will find beautifully manicured landscaping and custom hardscaping. Custom stamped concrete covered patio with stacked stone pillars, Built-in BBQ with fire-pit and retaining wall, custom gazebo with matching pillars, large side yards and back slope to ensure privacy. Extras include: Solar, reverse osmosis system, Vivant Smart House, whole house fan, built-in security system with cameras. Too Much to Mention!!! Sold by Tara Whelton of Redfin Corporation.